Nonwatertight (NWT) doors are used in NWT bulkheads and are of various types. Some slide, some fold, and others are similar to the regular house door (but made of metal). Some NWT doors have dogs, but fewer than those used on WT doors. Hatches are horizontal openings for access through decks. 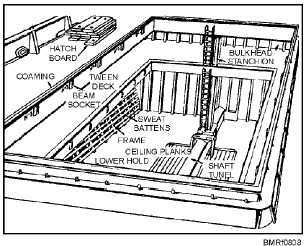 A hatch is set with its top surface either flush with the deck or on a coaming (frame) raised above the deck. Hatches dont operate with quick-acting devices. They must be secured with individually operated dogs or drop bolts. Figure 8-7 shows a typical hatch with an escape scuttle, which is a round opening with a quick-acting closure. An escape scuttle may also be found in the deck (or overhead) of a compartment that otherwise has only one means of access. Manholes of the hinged type are miniature hatches provided in decks for occasional access to water, fuel tanks, and voids. Bolted manholes are sections of steel plate that are gasketed and bolted over deck access openings. Manholes are also found in bulkheads but are not as common as deck manholes. A cargo hatch and hold are shown in figure 8-8. 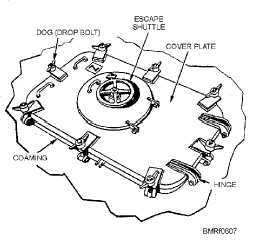 The hatch is a large opening in the deck that permits loading and unloading of equipment and materials. It is covered by hatch boards or a mechanical/hydraulic hatch cover. A cargo hatch is protected from the weather by a canvas tarpaulin (tarp for short). The tarp is pulled over the hatch boards and down the sides of the coaming around the hatch and then battened down. To batten down is to secure the tarp by wedging battens (slats of wood or steel) that hold it against the side of the coaming. Superstructure The solid part of a ship above the main deck is called the superstructure (fig. 8-9). The masts, stacks, and related gear above the superstructure are referred to as the ships top hamper (fig. 8-10). Masts are of three general designspole, tripod, and cage. On a single-masted ship, the mast is called simply the mast. 8-6 Student Notes: Figure 8-7.Bolted hatch with escape scuttle. Figure 8-8.Cargo hatch and hold. Figure 8-9.Superstructure.